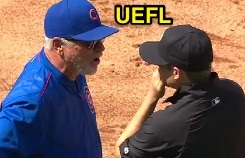 1B Umpire Tripp Gibson ejected Cubs Manager Joe Maddon for arguing a check swing (ball four) in the top of the 7th inning of the Diamondbacks-Cubs game. With two out and none on, Diamondbacks batter Paul Goldschmidt took a 3-2 changeup from Cubs pitcher Trevor Cahill for a called fourth ball, ruled no swing by HP Umpire Gabe Morales and affirmed as no swing by Gibson. Play was reviewed and adjudicated by the UEFL Appeals Board (Check Swing), the call was incorrect. At the time of the ejection, the Diamondbacks were leading, 3-2. The Diamondbacks ultimately won the contest, 3-2. This is Tripp Gibson (73)'s first ejection of the 2016 MLB regular season. Tripp Gibson now has -2 points in the UEFL Standings (0 Previous + 2 MLB - 4 Incorrect Call = -2). Crew Chief Hunter Wendelstedt now has 1 point in Crew Division (1 Previous + 0 Incorrect = 1). This is the 67th ejection report of the 2016 regular season. This is the 27th Manager ejection of 2016. This is Chicago's 2nd ejection of 2016, 3rd in the NL Central (PIT 5; CIN 3; CHC 2; MIL, STL 0). This is Joe Maddon's first ejection since September 19, 2015 (Bruce Dreckman; QOC = U [Throwing At]). This is Tripp Gibson's first ejection since September 8, 2015 (Mike Scioscia; QOC = Y [Check Swing]). Wrap: Arizona Diamondbacks vs. Chicago Cubs, 6/5/16 | Video available via "Read more"